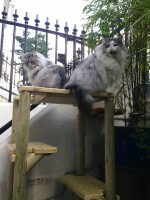 Climbing up high is extremely important for a cat. 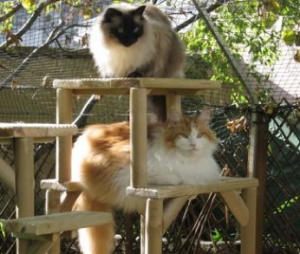 Cats like high places for safety, for looking down on ‘their’ territory, for their own space away from people, and to play on.. stretching their muscles and keeping their nails healthy and cat climbers represent an-indoor or outdoor personal tree. It’s a small family run business with impeccable customer service and attention to small detail. The company offers ‘set’ designs in different shapes/heights: http://www.cat-climbing-towers.com/products.php as well as customised designs or requests from the client. After quoting a price they quickly get to work hand crafting your climber. It is then delivered as a whole unit within a very reasonable time frame and arrives very carefully wrapped. 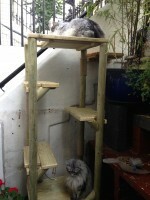 David Hodgetts, the carpenter/designer, is now looking into designing cat climbers that look like trees. Apart from the US (who charge stupid money making these types of climbers) their is no one else in the UK making them so keep checking their web site for updates. 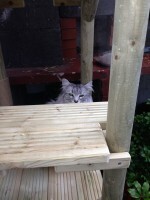 I wish him and his company the very best of luck and if you want the best climbing frame for your cat and want a very personalised and friendly service I can’t think of a better company to go to. David recently designed a new climber for me which we called The Mars. Perfect for work, rest and play.